Over the last few years, more than 65 million people have been forcibly displaced from their homes due to war, persecution, and other disasters; nearly a third of them have been officially classified as refugees by the United Nations. As part of their work responding to this global humanitarian crisis, three leaders from the organization World Relief published the award-winning 2016 book Seeking Refuge: On the Shores of the Global Refugee Crisis, which both offers a practical, well-rounded, and well-researched guide to the issue and calls the church to care for those in need. Many CCCU campuses are already finding important and unique ways to help and learn from those affected by the crisis. 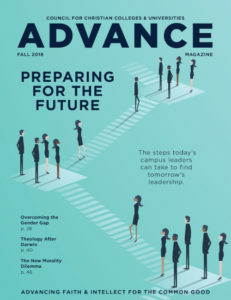 Morgan Feddes Satre, the editor of Advance, recently interviewed Matthew Soerens, World Relief’s U.S. director of church mobilization and a co-author of the book, to see what the book’s impact has been over the last year and to learn what more Christians, especially Christian college leaders, can do. Remind us what the book Seeking Refuge is about and who it’s for. Seeking Refuge is about the global refugee crisis, which is unfortunately an unprecedented crisis at this point. There are more people forcibly displaced in the world today than at any point in recorded history. Of course, we’d love for anyone to read the book, but our real call is for the church to respond to that refugee crisis. We think that the church – both in the U.S., where the three authors are all based, but also globally – ought to be at the center of the response to this crisis, and that in some ways God has uniquely positioned the church to respond in a way that no other institution or person or organization can at a global level. Most of what we’ve done in the book is try to help those who are followers of Jesus think from a biblical perspective about refugee issues and get a good handle on the facts – because as we all know there’s a lot of confusion and misinformation out there about refugees right now – and then profile a number of the refugees whom we’ve had the opportunity to serve at World Relief both in the U.S. and globally over the decades that we’ve been involved in the refugee ministry with local churches. The rest of the book is really making the case to the church that this is its moment – that now’s the time to shine, as Jesus says, to shine like a city on the hill, and not a time to hide our light. What has the response been? Has anything changed now in the year it’s been out? We’ve been really encouraged by the response to the book. We’ve heard from a lot of church leaders that it’s influencing their thinking. But I wouldn’t claim that it has changed the perspective of every American Christian. The reality – and I think what makes the message more urgent than ever, in my mind – is the topic of refugees has become more divisive in the past year than it was even when we were releasing the book. Even five years ago, I don’t remember [allowing the arrival of] refugees being divisive. Questions of legal status issues [for undocumented immigrants] have always been controversial … [but for refugees], everyone understood, well, these are people fleeing persecution. … They all come in with full legal status. I think it was rare that we found a church that didn’t think that [accepting refugees] was a good thing to do. Frankly, we’ve seen that start to shift in the past year or two. I wouldn’t say we’ve seen that much at the church leadership level. … But we certainly have seen it at the congregational level, and we’re well aware of the public opinion surveys that show that among white evangelicals, the majority actually think we should, as a nation, be pausing refugee resettlement. That’s a vision that we at World Relief don’t agree with, and my coauthors and I wouldn’t agree with. Part of the reason for [writing] the book is to make the case for why, first and foremost as Christians, we should see the arrival of refugees not as a threat but as an opportunity to love our neighbors as ourselves, to … practice hospitality as the Scriptures command us, and then also to address some of the many misconceptions [about refugees] that I think have fueled so many people to have a fearful response. Obviously, this has become a political issue. I’d rather it not be such a political issue, but it has become an issue [where] many people see your views on refugees and think they know what political party you are a part of. I think that’s actually a shame, because [helping refugees] ought to transcend partisan politics. It’s about the core of the values that made the United States a great nation, but more importantly, it’s about the biblical values that guide me as a follower of Jesus. Are you seeing any signs of hope? Frankly, at this point World Relief … [has] a lot more churches that want to welcome refugees than we have refugees arriving, because there are very few folks arriving at this particular moment. But the number of churches that have been coming forward to us and saying, “Hey, how can we help?” has increased significantly in the last year or two. The amount of private funding to support refugee resettlement efforts has increased significantly. … That’s happened at the same time that, at a national level, we’ve seen polling that suggests that most white Christians across a variety of [faith] traditions have very significant reservations about refugees arriving in the country. How do you recommend campus leaders engage with this issue and with your book? There are lots of Christian college campuses that are really close to places where refugees are being resettled, whether by World Relief or by the Lutheran Immigration and Refugee Services or one of the other resettlement agencies. A huge number of our volunteers are Christian college students. We benefit from that immensely, and the refugees we serve benefit from that immensely. But I’m also quite confident – and this is in some ways part of my story, because I started engaging refugee issues as a senior at Wheaton [College] – I’m quite confident that the students benefit from it incredibly as well. Not every student is going to travel abroad and spend a year of their college career in a different country, but there are probably people who have had incredibly different life experiences than [students] have had living within a mile or two of their campus. Anything that an institution like a college or seminary can do to help facilitate those relationships [between students and refugees], I think, is a win-win on both sides. The book also is a tool even to help [students and campus leaders] take a step before students might be ready to [volunteer]. … They might have some questions that need to be answered first. They need a biblical foundation for why we would respond to this issue. That’s where I hope the book would come in – it’s a pretty short read, but it’s meant to help people think through this topic and then think carefully about what the next steps are. That might be [volunteering] locally. It might be saying, “Hey, we could do something to partner globally to respond to this issue.” That’s something we do at World Relief as well, and we’ve seen Christian students be a significant part of supporting some of the work we do in the Middle East and other parts of the world in responding to refugees and displaced people. Matt Soerens is the U.S. director of church mobilization for World Relief and a co-author of Seeking Refuge.